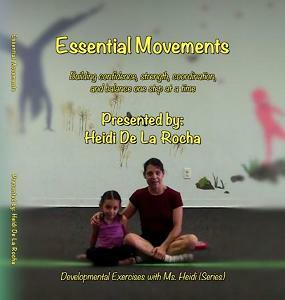 In this DVD, Ms. Heidi presents fun, age appropriate motor-planning activities (ages 2-4) and strength building, balance, and soft gymnastics activities (ages 5-10). She shares activities that can be done in the privacy of one's own home. You can be your own child's coach/teacher as he/she learns a solid foundation in movement development. Heidi De La Rocha is teacher and owner of Heidi's Musical Gym where she has been teaching thousands of children in creative motor skill development for over 14 years. Her activities have been endorsed and recommended by physical therapists, doctors, and teachers who deal with children. Ms. Heidi has been teaching her passion, nurturing children through movement and fun for over 20 years. $24.99 + $2.95 shipping and handling. Available in the US only.